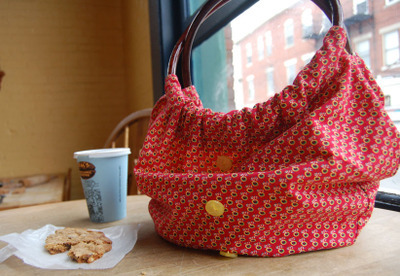 This bag is making me very happy this week (but looking at this photo right now I think I'd gladly trade it for another one of those cookies and some of that coffee. Yum). 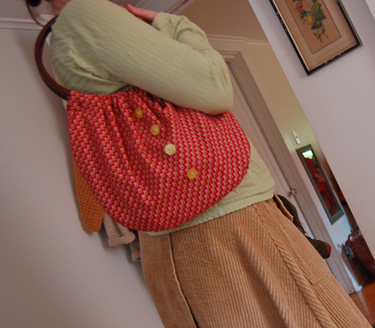 I've been carrying this other bag around since I made it, and it was high time for a new one. I wanted to use these round handles I got at JoAnn's when they were on sale a bit ago (did you know they sell bag handles now? Not so bad, really. ), but it took me a while to wrap my head around how to actually sew them on. The delicious fabric is from Lisa, and the yummy yellow vintage buttons are from Sally (nice adjectives. i'm still thinking about the cookie). And the photo is from my Calvin.